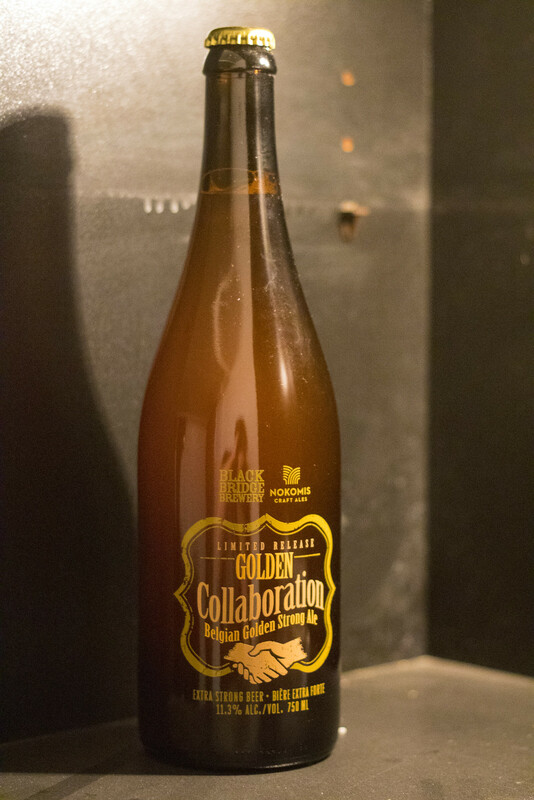 As you know, I'm a big fan of collaborations between breweries. While I was in Saskatoon, I went to the local CO-OP liquor and saw this beer on the shelf and I just had to buy it! It's a collaboration between Swift Current's Black Bridge Brewing and Nokomis' Nokomis Craft Ales. 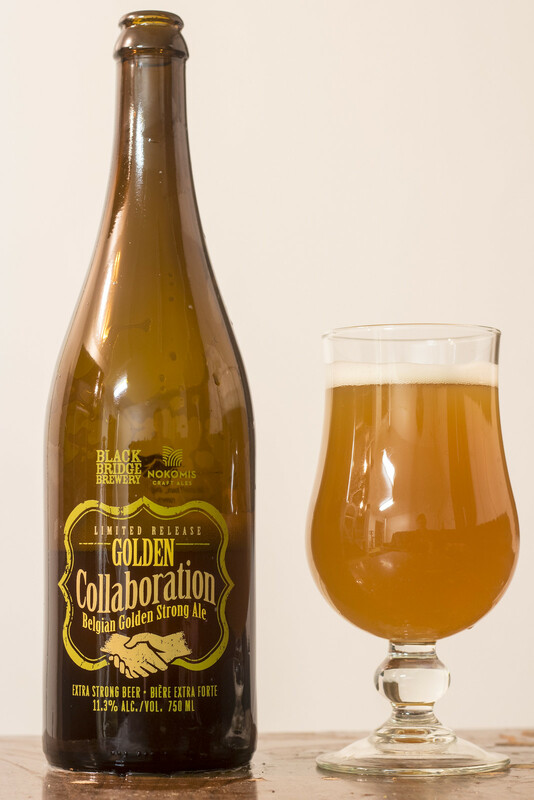 The beer, Golden Collaboration, is a Belgian Golden Strong Ale brewed at 11.3% ABV. From the label: From small town, and even smaller town Saskatchewan, comes a collaboration of two brewers that have a passion for creating excellent beer. This Belgian Strong Ale has a complex fruity aroma and a dry white wine finish. Staying true to the style, it is a bottle conditioned beer when poured with leave a white foamy head with an effervescent carbonation. Appearance: THIS IS A SERIOUS GUSHER! HOLY! Belgian style ales are notorious for being gushers, so I always forget to open near a sink... so I ended up with wet pants and smelling like beer. Once I'm able to get beer into the glass and not all over me or the floor, it pours a beautiful, unfiltered, cloudy orange with a moderate amount of sediment floating throughout the glass, and tops off with a light white head (once the gushing ended). Aroma: I'm getting a good deal of white wine and oak in my initial impressions. There's a good amount of Belgian yeastiness that gives it a bit of barnyard funkiness to it yet also has a bit of breadiness. This is quite sweet with lots of fruity notes like apple/pear, lemon and pineapple popping up here in there. Slightly sour and I think this is going to be an absolute amazing beer judging by the aroma alone. Taste: The 11.3% ABV really pops out in this beer as I'm getting a heavy booze burn for my first initial sips. Once the burning calms down a bit, I notice flavours of white wine again, a hefty amount of oaky woodiness, something that reminds me of rum.. maybe a bit of vanilla? It's lightly sour.. not as sour as a lot of Belgian styles now days. There's a good deal of sweetness lingering at the very end that contains mostly pineapple, but also a bit of apple/pear. This is definitely a sipping beer. Overall Thoughts: I've never had a bad beer from either Black Bridge or Nokomis and this definitely isn't an exception. Even with the gushing, this beer is absolutely delicious, yet over the top. It's incredibly strong and boozey but has lots of great Belgian notes as well as white wine popping up in every sip and sniff.